This software is designed to be very easy and intuitive to use. Within minutes you will be able to start making phone calls. Simply download now and install. Advanced settings give you a completely flexible phone solution. Axon Agent is an add-on that allows call center agents to take advantage of Axon's auto-dialer functionality. 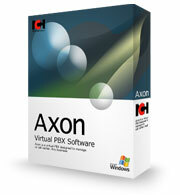 Axon is a virtual PBX designed to manage calls in a business or call center. Any business, whether small or large, can now implement a scalable VoIP based PBX by installing this software on any Windows PC. The software works as a fully featured telephone switch connecting to phone lines and extensions using state-of-the-art VoIP technology.